Am I the only one who stores swimwear in the laundry room? Yup, that’s were we keep the whole family’s swimsuits! In that bin on the laundry room shelf along with the beach towels and such while the pool passes and goggles hang on our laundry organizer sign. It just seems easier to have them all in one place so daddy (he’s the pool person) can find them when he takes the kids for a swim. That way he doesn’t have to go looking in separate rooms. Think I’ve had that bin for at least 4 years. It is one of those Rubbermaid ornament storage boxes (see the red and green lid) you get on “After Christmas clearance” for $5. Used to look like this! Your run of the mill see through plastic bin; great for storing ornaments where you can see what is in it but not ideal for swim suits in a mix of colors. To add insult to injury, the box was stored in our garage during the move and ended up getting many scratches all around. What’s a girl got to do with an eye sore storage bin in her spanking new, fresh off the paint job laundry room? A piece of lace (not shown) – Not necessary if you are a precise crafter and can line up the book pages correctly when gluing. A stable and clean surface to work on. 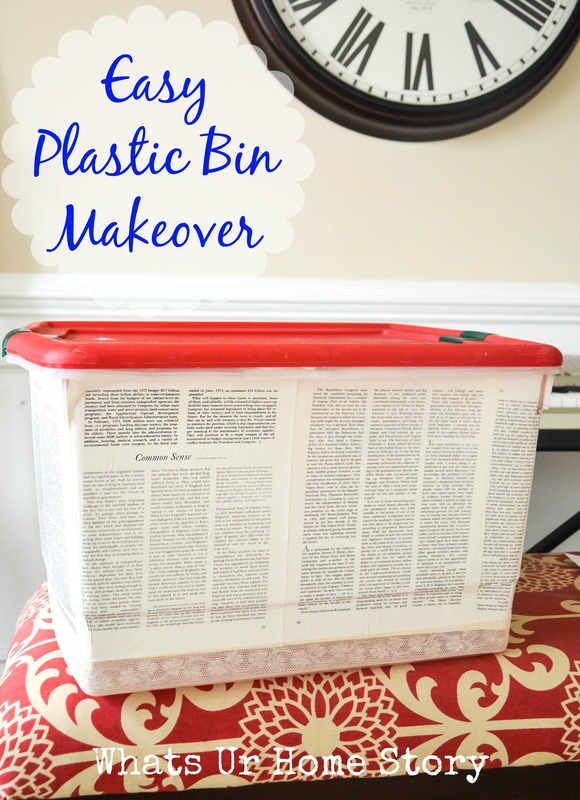 Clean the plastic bin thoroughly with a damp paper towel. Let dry. Starting from the center of a side gives an impression of an even wrap vs. starting at the corner. 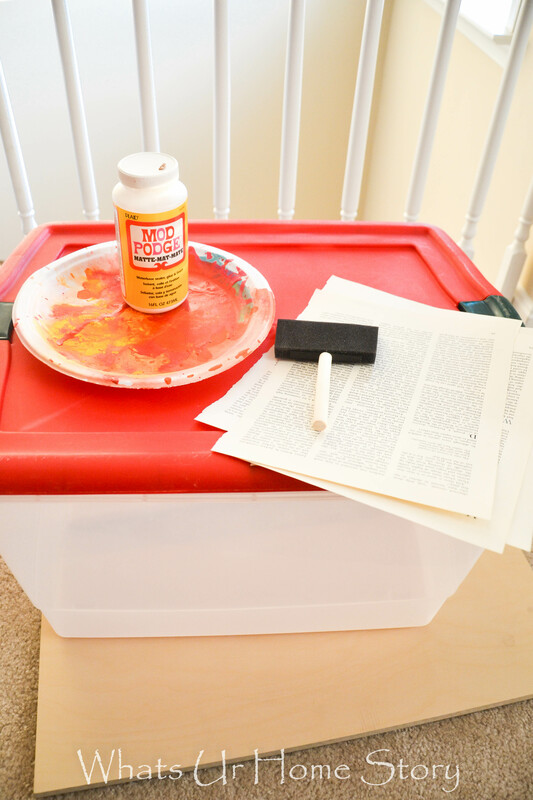 Apply Mod Podge liberally onto the bin. 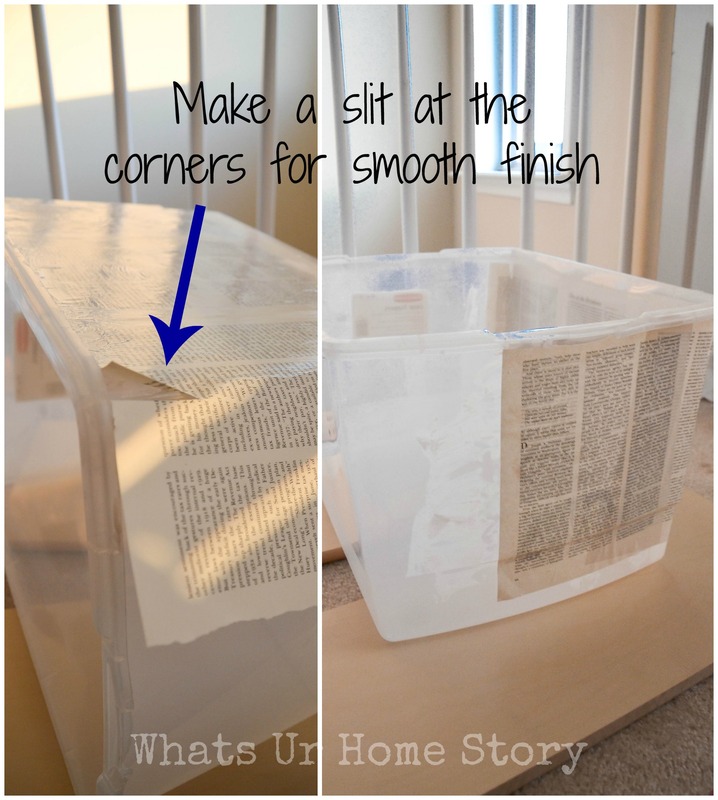 Glue the page and coat with more Mod Podge. Smooth out any air bubbles by rubbing an old credit from the center towards the edges. If your box’s upper corners are sharp like mine cut a slit in the book page (see below) so that you can wrap the page around the corner smoothly. 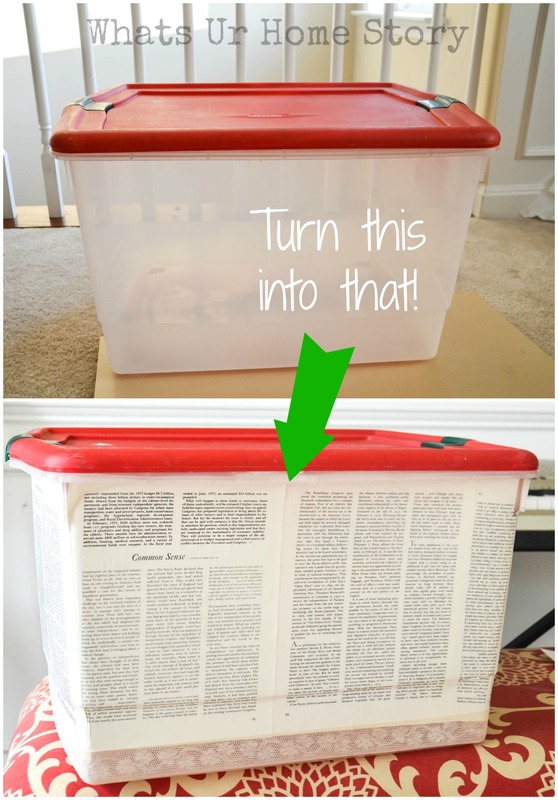 Keep going until you cover the entire box with book pages. Let it dry over night. Like I mentioned earlier, if you are a precise crafter you are done by now but for folks like me who are on the sloppier side accidents like this uneven gap happen. The gap was hardly an inch wide at the widest part, the right size for a piece of lace. And I have lots and lots of vintage left over from my lace chandelier and lace Christmas ornament projects. So lace it was! I just Mod Podged (is that even a word?) 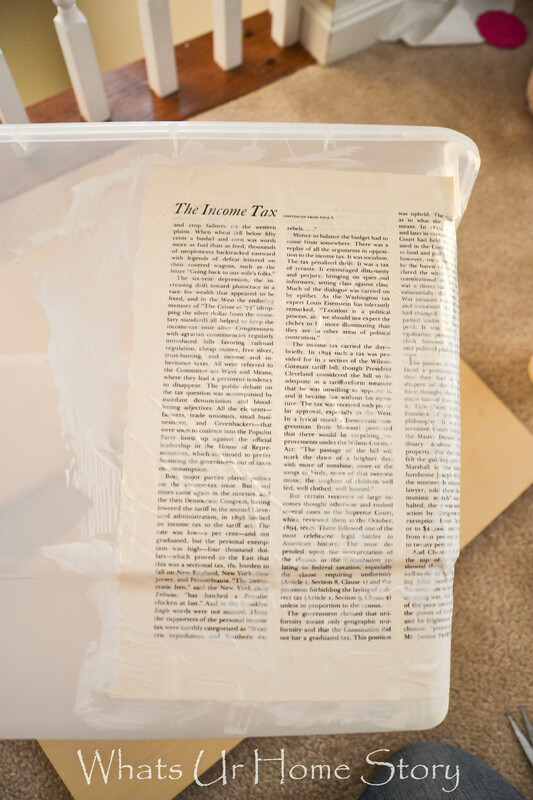 it to the box like I did with the pages. 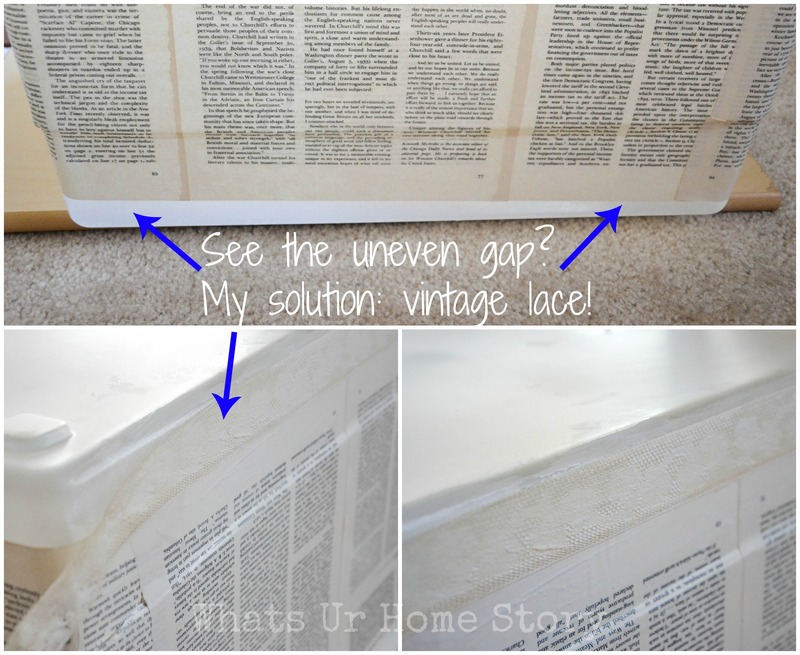 And it did a great job covering up the gap neatly, don’t you think? 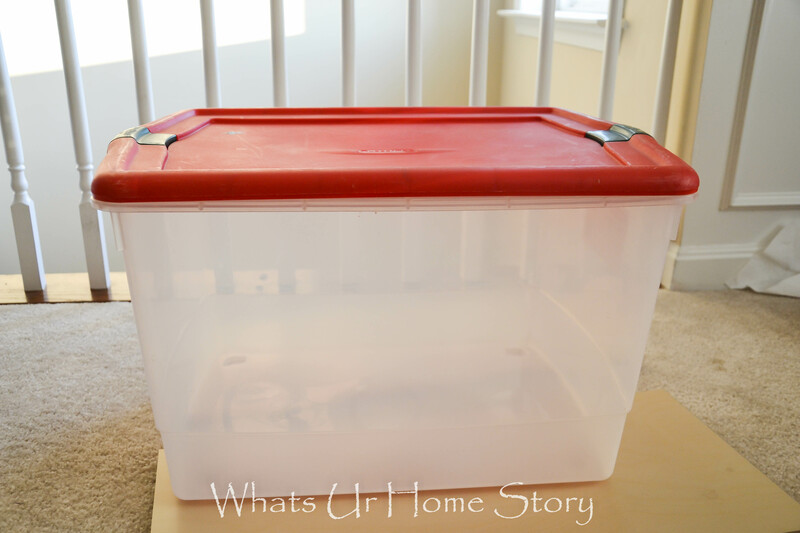 Do you use plastic bins like this to store swimsuits err….off season clothing? Ever made over one of these bad babies? Neat! I love the subtle look of the paper! Cool bin! 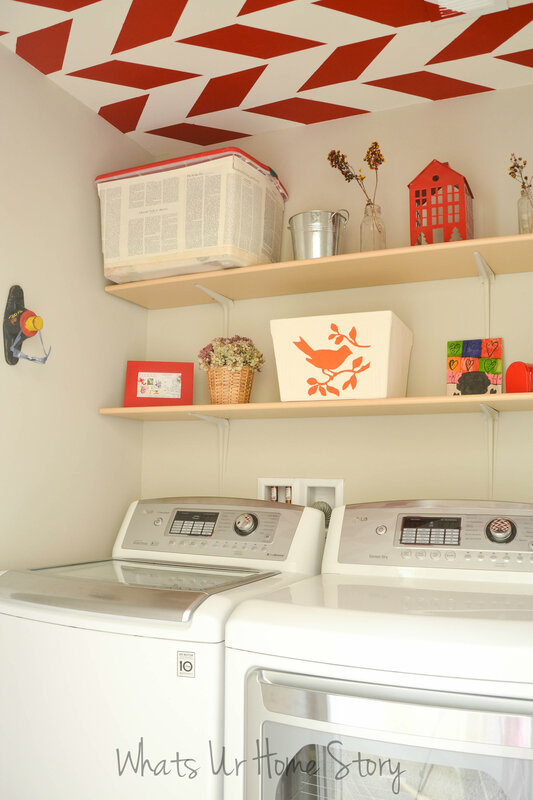 Your post reminds me I need to makeover our laundry room! Ugh, my project list is never-ending! Ah…..let’s just say my laundry makeover took at lest 2 years! Glad that it is over! The room is actually so much more functional.